The Internet has become the most important part of our life. Chrome is one of the most popular and widely used applications over the Internet. If you are a frequent user then you might have encountered some issues or errors on this browser. One among them is ERR_EMPTY_RESPONSE error. This is one of the most common error and can also occur in other applications like Firefox, Drupal, PHP, Ajax, WordPress and sometimes on Youtube also. The ERR_EMPTY_RESPONSE error occurs whenever the attempt to log in a website fails. It just blocks you and stops you from reaching the site. It shows that there is some problem with the Website server, but it happens often because of any problem within own system. We have to admit that we cannot solve any problem related to the website server but we can make some efforts to solve this ERR_EMPTY_RESPONSE error if the cause for the error is started from our side. Now let’s see what are the possible thing we could do to fix this error. We cannot say what is the exact cause for the appearance of this error, as there is a lot of things responsible for this. Even the causes may be your browser, driver or other junk files of your computers. Whenever the ERR_EMPTY_RESPONSE error occurs, the first thing you should do is to check your network connection. Check whether your computer is properly connected to the Internet or not, also make sure whether the status of your network device is good. The error may occur if there is any problem with your network connection. Open Chrome or the browser you are using (here we use chrome, for example, you can use the same process for other browsers too). Go to the browser toolbar, and select the chrome menu. Then Select More tools >> and clear the browsing data. Clear browsing data command box will pop up. Select Cookies and other site and plug-in data and Cached images and files. Normally set the amount of data to be deleted as one week. It is quite enough. 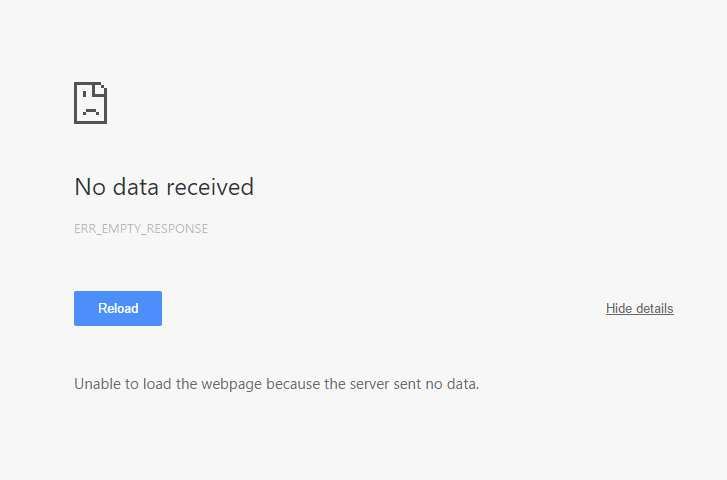 Finally, restart the chrome browser and try to load the sites in which the problem occurred. Go to start menu and type cmd which means command prompt. Right-click on it and select Run as administrator. Type the following commands on the command prompt and press enter. Reboot your system and then check with chrome. See if the problem is resolved. We have shared you with all the possible way to fix ERR_EMPTY_RESPONSE error. But we are not sure which method will work for you so try everything with patience. If you know any better fix for this error, do share with us.